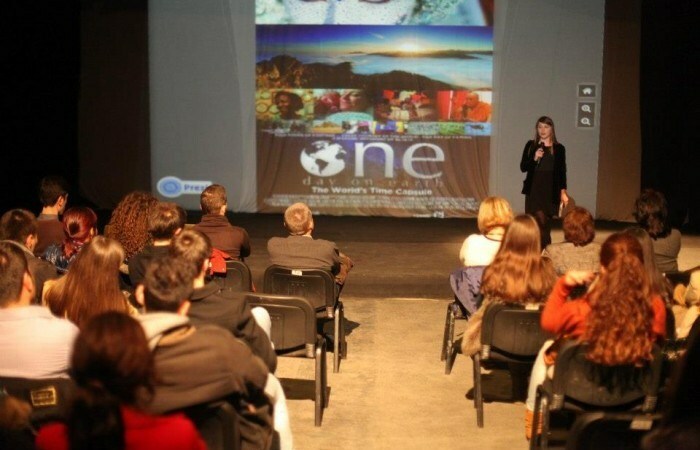 The eleventh edition of BarCamp Prishtina gathered, for one more time, more than hundred people at Oda Theatre. Except the guest speakers who focused their presentations in the cultural field, this edition of BarCamp was different also because 60 percent of the audience were females. A Wiki Academy Kosovo reward winner Bujar Gashi, and Nita Deda, the author of the documentary that hit the world audience, were the guest speakers for this edition. Bujar Gashi, the author of a photo which has been selected as the second best at WikiAcademy Kosovo, presented his work and passion around the Facebook Page Explore Kosovo that has gained attention of people in Kosovo and beyond. Bujar, who is dedicated to this work just for fun and not for money (he is not paid by anyone for doing this) told the audience that he likes to do take pictures of different beautiful and interesting places around Kosovo so people can see more from our country. Being asked by the audience regarding his work and the motivation that stands behind him, he explained saying that “it’s our duty to promote our country. We have so many things to show to the world and we can’t wait for others to come and do what we are in charge to do”. She took the stage by showing the documentary about “Our Bride – Nusja Jone”, explaining how she discovered this rare tradition of the Goran Community, during which they prepare the bride with special make-up before getting married. Nita talked also about who she got featured on the cover of “One Day on Earth” and how this has also been mentioned on CNN. Her talk than continued with focus on DOKUFEST and the impact that this activity has in the life of the citizens of Prizren, in the culture of the city, in the whole country, and in the economic field. She explained that according to a report by GAP, DOKUFEST brings in quite a lot of money to the city. Nita talked about the role of volunteers, about the cinemas created throughout the city and about the future plans of the event. The audience had some questions like what is the age limit to participate as a volunteer, and what are the criteria’s to apply for work at DOKUFEST. By the end of the event, a short documentary about a family and its suffering after the Chernobyl accident was shown to the audience.